Rebecca Wong gets a sneak-peek of the upcoming MUSE production. 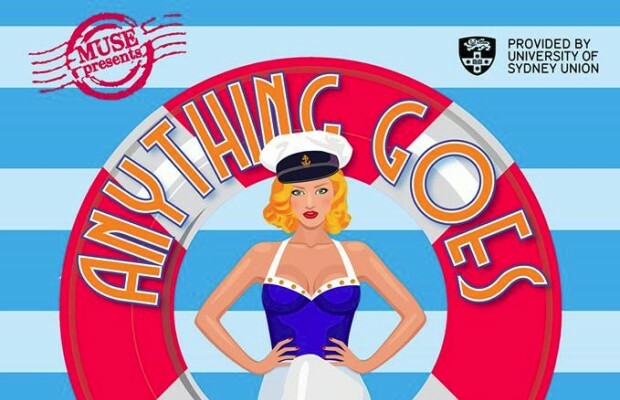 The University Musical Theatre Ensemble’s (MUSE) production of “Anything Goes” takes us on a spirited, risqué romp through 1930s America, with a cast of characters guaranteed to charm, shock, scheme and seduce your socks off. In an attempt to win the affections of the soon to be married Hope Harcourt (Genevieve de Souza), roguish but lovable stockbroker Billy Crocker (Ant Sandler) stows away on an ocean liner bound for London. He is aided by Evangelist-come-nightclub entertainer Reno Sweeney (Tash Stanton), and feckless gangster Moonface Martin (Liam Beiglari). Complemented by an equally strong supporting cast, the camp exuberance and smouldering, superbly-acted chemistry between the leads brings their characters to life. “Anything Goes” is explosively funny. Cole Porter’s highly-acclaimed score bristles with gags and witticisms, all delivered with an eye-rolling theatricality that itself provokes laughter. The humour vacillates between cringe-worthy and crass; the deliciously coquettish Erma (Anna Colless) had your reviewer giggling like a schoolgirl. Billy’s financier boss, Elisha Whitney (Jordy Shea), is portrayed as an incompetent and dissolute has-been, serving as a reminder of the bleak contextual backdrop of 1930s economic stagnation. Other comical highlights include Whitney’s drunken antics, and Moonface’s clumsy attempt to hide a dog in his pants. Hope’s English fiancé, Lord Evelyn Oakleigh (Alex Andrews), serves as a delightfully awkward foil to the amorous Billy, a part that Andrews deliberately hams to great comic effect. The show frolics its way through a pastiche of dance styles, notably an impressively fast-paced tap-dances by Stanton and Josh Chee. The two main dance numbers, “Anything Goes” and “Blow Gabriel Blow”, are tight, deftly-executed and bursting with palpable energy. Choreographer Georgie Spong takes full advantage of the stage, with the kinaesthetic coordination and vocal warmth of a 36-voice ensemble lending the full-cast numbers a richness that occasionally chafes at the physical confines of the rehearsal space. Hopefully this will be remedied somewhat by the larger performance space of the Everest Theatre. Duets like “You’re the Top” and “Friendship” neatly play the characters off against one another, and it is this juxtapositional interaction that really animates and endears them. The vocal performances, whilst stylistically not as strong, are certainly worthy of Porter’s luxurious, swinging score. Sandler’s transition from his warbling old woman disguise into the sensual, crooning duet “It’s De-lovely” is breathtaking, and the indefatigable Stanton shines in her role as the show’s leading lady. The performance attempts to redefine the uncomfortably racist Chinese caricatures present in the original score by exaggerating the stereotype to match those of their farcical American counterparts. For the most part, this is consistent with the overall flavour of the show as one that refuses to take itself seriously. The characters come across as ironically self-aware rather than convincing. Along with numerous revisions to the 1934 score, this makes the production feel like a celebration of authentic period theatre rather than of the period itself. However, the undemanding humour ensures it remains accessible to all audiences. Vibrant, hilarious and polished, this year’s Muse major is a show not to be missed.